Northwestern students kick off the 43rd Dance Marathon. The first block’s celebrity videos featured Facebook COO Sheryl Sandberg and political commentator James Carville. For the 43rd year, Dance Marathon kicked off its first block as more than a thousand dancers ran into the tent in Norris University Center on Friday evening. 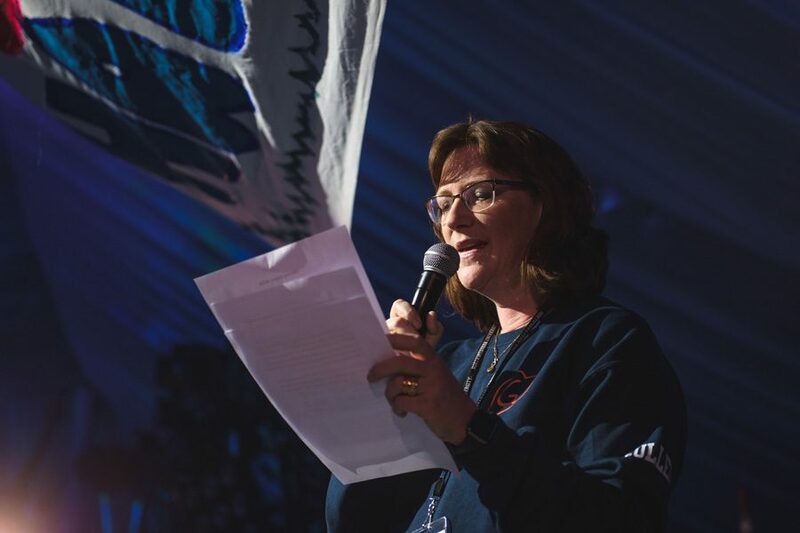 Minutes before, Maura Cullen (Weinberg ’87), liaison between GiGi’s Playhouse and DM, welcomed dancers to the tent and reiterated the importance of inclusivity. GiGi’s Playhouse, a nonprofit that supports and advocates for people with Down syndrome, is DM’s primary beneficiary this year. Cullen thanked dancers for supporting GiGi’s Playhouse. Dancers also listened to a speech from a representative from the Evanston Community Foundation, DM’s secondary beneficiary. This is the 20th year of DM’s partnership with ECF. After Cullen spoke, the emcees — Weinberg sophomores Daniel Abia and Kinsey Erickson — kicked off the first block. Among other things, Erickson and Abia promoted the NUDM app, which provides notifications throughout the 30 hours of dancing. Nearly an hour into the block, the dancers paused to recognize and thank the Norris staff. “This is the last time that’s we’re going to be able to have Dance Marathon at this Norris,” Erickson said, referring to the University’s plans to replace Norris with a new student center. The new structure, named University Commons, will be about 209,000 square feet, a 21 percent increase in usable space compared to Norris. Patricia Telles-Irvin, vice president of student affairs, visited the tent briefly to cheer dancers on. “I just came from … the Board of Trustees today and they send you their support, their love, and they’re very proud of what you do,” Telles-Irvin said. The first block’s celebrity videos featured Facebook COO Sheryl Sandberg and political commentator James Carville, who encouraged students to keep dancing.